Editor’s Note: This timeline is the product of multiple reference records that include the following sources: correspondence (email threads, list serve posts, and hard copies), meeting Minutes and Financial Statements for both LLHC and LLAA, hard copy and electronic alumni newsletters (‘Lambda-Lambda Lines’ and others), back issues of Elon University’s yearbook (Phi Psi Cli), Elon University Archives and Special Collections, Kappa Sigma International Memorial Headquarters records, content available via social media, fraternity composites, general Internet search, plus anecdotes contributed by chapter alumni. That said, by no means should this be considered a fully comprehensive historical overview — please excuse any unintended inaccuracies/omissions. 1952-53 – With the help of Elon faculty member Dr. William Moseley Brown (among the original founders of Omicron Delta Kappa, the national leadership honor society), the Lambda Chapter of Sigma Mu Sigma Fraternity is established at Elon College. Sigma Mu Sigma has a presence on a handful of other campuses, so the chapter rightfully claims the distinction of being the first national fraternity on the Elon campus. Luther Byrd serves as the Faculty Sponsor. During this era, the Elon campus does not include residential quarters for defined student organizations. Fall 1963 – Fourteen Sigma Mu Sigma brothers move into the newly renovated Neese House at 108 S. Williamson Avenue, just south of the railroad crossing – a property owned by Elon College that had been used by new faculty members. Early spring 1972 – By now, a number of national fraternities and sororities have established chapters on the Elon College campus, yet the Lambda Chapter of Sigma Mu Sigma is considered one of Elon’s local fraternities due to various transitions of the parent organization. The chapter’s postal address is PO Box 911, Elon College, NC 27244. April 7, 1972 – By letter sent to William D. “Bill” Dorsey (a chapter development officer of Kappa Sigma Fraternity – an international fraternity headquartered in Charlottesville, Virginia), Sigma Mu Sigma president Mark Smith asks that the chapter be considered for colonization by Kappa Sigma. April 26, 1972 – Bill Dorsey of Kappa Sigma pays an ‘investigation visit’ to the Sigma Mu Sigma chapter of Elon College. May 8, 1972 – In the initial vote by the undergraduate brothers, the chapter votes 21-9-1 to break affiliation with Sigma Mu Sigma and seek affiliation with Kappa Sigma. In a second vote taken after considerable discussion, the tally was unanimous, in favor. The break with Sigma Mu Sigma is to become effective June 1. June 1, 1972 – As of this date, the Sigma Mu Sigma chapter of Elon College effectively withdraws its affiliation with the parent organization. (Before the former Sigma Mu Sigma chapter members may become a colony of another national fraternity organization, the chapter must formally disassociate itself from the parent organization.) This sets the stage for formal affiliation with Kappa Sigma. December 1, 1972 – On this date, Elon College Dean of Students W. Jennings Berry formally accepts the withdrawal action made on June 1. At this point, the chapter is considered a ‘local fraternity’ in the eyes of the institution thus granted eligibility for affiliation with a national fraternity organization such as Kappa Sigma. December 13, 1972 – In a petition addressed to the Kappa Sigma Supreme Executive Committee, Bill Dorsey recommends that Kappa Sigma colonize the Lambda Kappa local fraternity at Elon College. January 12, 1973 – By unanimous consent, the SEC approves the petition for colonization of Lambda Kappa Fraternity at Elon College. Mark Smith agrees to continue as president — now known as the Grand Master of the Kappa Sigma Colony. May 1-2, 1973 – Bill Dorsey visits the Colony and finds the group ‘in excellent condition’ and with 40 members eligible for initiation. During his visit, he secures the commitment of Melvin Shreves (a Sigma Mu Sigma alumnus and current Elon College staff member) to assume the role of Alumnus Advisor. Shreves shall be initiated into Kappa Sigma as a founding member of the chapter. In a memo to Kappa Sigma District Grand Master VII Bruce McDaniel, Dorsey proposes that the Colony be initiated on September 21-22, 1973. September 21, 1973 – Forty present and past members of Sigma Mu Sigma are initiated as charter members of the Lambda-Lambda Chapter of Kappa Sigma. The chapter’s founding Grand Master (GM) is Gary Evans (initiate #1), Melvin Shreves #17 serves as the chapter’s first Alumnus Advisor (AA), and Anne Dechert is the Sweetheart. The new chapter resides in the territory of Kappa Sigma District Grand Master (DGM) Henry Nichols. 1974 — John Sealy #26 is chapter GM, and Anne Snipes is the Sweetheart. Spring 1974 – The chapter publishes and circulates via postal mail the first alumni newsletter. 1975 – Rick Coradi #43 is chapter GM, and Angie Ingram is the Sweetheart. Spring 1975 – A stray dog shows up at Neese House. Bill Gortney #50 and Les Hall #56 are among those who feed her, and John Muir #33 persuades the brotherhood to regard her the chapter’s mascot. Quickly, “Fido” becomes a beloved extension of the Kappa Sigma brand on campus. Faculty allow her to attend classes with her fraternity brothers, and she is regularly kidnapped by sorority pledge classes during their scavenger hunts. For the next decade, Fido will accompany various fraternity brothers on their summer and holiday breaks in cities up and down the eastern seaboard. Spring 1976 – The chapter’s Executive Committee (EC) led by GM Les Hall #56 takes office. Jimmy Simmons #47 becomes the chapter’s AA. Raphael Clarke is the Sweetheart. November 1976 – Chapter GP Bill Gortney #50 serves as Elon’s SGA VP. The chapter is placed on sanctions and fined by Elon College for allegedly instigating the all-fraternity egging of the TKE house on Halloween night — an event in which one TKE member suffered a serious eye injury. Aside from standing liable for a $700 fine (widely loathed as an exorbitant financial penalty), the chapter is forbidden from pledging a new member class in the coming semester. February 1977 – The EC led by GM Steve Slough #69 takes office. Dawn Luciano is the Sweetheart. Lynn Ryals is the Faculty Advisor. Chapter GP Bunny Carr #75 serves as Elon’s SGA VP. To skirt college rules that forbid a pledge class, the chapter quietly assembles an alternate pledge class of 12 ‘social affiliates’ led by Lee Berryman #102. The social affiliates do not wear pledge pins and are not to be called pledges by chapter initiates; otherwise, they perform all of the time and task obligations expected of pledges. Spring 1977 – The chapter celebrates its Spring Banquet in Myrtle Beach, South Carolina at the Hawaii Kai Motel at 1105 South Ocean Boulevard. May 1977 – After probation is lifted by Elon Dean of Student Affairs William G. Long, the chapter formally pledges the remaining 7 social affiliates who have opted to continue. The member recruitment rules of Kappa Sigma forbid a member’s initiation before 60+ days have passed after the pledge oath, so the members of the spring class are expected to fulfill their pledge obligations over the summer in their home towns and then into the fall semester. Summer 1977 – Undergraduate members, pledges, and chapter alumni attend an epic weekend retreat hosted by GM Steve Slough #69 at his family’s cabin in the hills of Virginia. 1977 – Ron Osborne #96 becomes the chapter’s AA. Early September 1977 – As returning students settle back into campus life, members of Kappa Sigma’s spring pledge class are conspicuous for being the only pledges on the Elon campus. Kappa Sigma’s pledges wear pins and participate in pledging activities such as house duty, the scavenger hunt, and the pre-initiation ‘Journey Week’. September 15, 1977 – After enduring the longest pledging period in chapter history (nearly 250 days), 7 surviving members of the original spring 1977 class of ‘social affiliates’ are formally initiated by the chapter. Fall 1977 – IMH awards Scholarship-Leadership awards to GT L.W. Waldrup #72 and GP Bunny Carr #75. GM Steve Slough #69 and Garry Fitchett #92 are honorable mentions. January 1978 – GT L.W. Waldrup #72 says he expects Lambda-Lambda House Corporation to be formally incorporated in coming weeks. He reports the alumni association currently has two $1000 bonds paying $36.54 every 90 days and $1036 in a savings account. February 1978 – The EC led by GM Jim Woolford #73 takes office. Susan Cobble is the Sweetheart. Elon College is engaged in a federal court case involving town-gown friction created by the institution’s existing Greek housing arrangement (i.e., the fraternities and sorority houses are located within residential neighborhoods). February 22, 1978 – The Lambda-Lambda House Corporation (LLHC) is officially recognized by the State of North Carolina. The corporation’s singular charge is to assemble the funds required to purchase and operate an off-campus facility to house Elon’s Kappa Sigma chapter. The Bylaws prescribe for dues paid by undergraduate chapter members to be $10 per member per semester. Members are expected to continue this pattern of giving after graduating. Undergraduate chapter GT L.W. Waldrup #72 is the incorporator, and recent graduate Les Hall #56 serves as the corporation’s first President. Note: Tom Hall #44 began this initiative in collaboration with Mike McGinnis – an official at Kappa Sigma International Memorial Headquarters in Charlottesville, Virginia (IMH). Following Hall’s graduation from Elon, Waldrup completed the process and served as the corporation GT for several years thereafter. April 21-22, 1978 – Because of severe treasury shortcomings caused by a combination reckless social spending, inadequate money-makers, and a few too many outstanding dues, the chapter selects Richmond, Virginia as the site for its Spring Banquet. The hotel is the Holiday Inn-North, and the entertainment is “The Band of Oz”. The banquet favor is a clear highball glass with the Neese House etched in green. 1978-79 – Chapter GT Lee Berryman #102 serves as Elon’s SGA Treasurer. Fall 1978 – The highlight of the 5th anniversary Homecoming reunion is the road trip via charter buses to a banquet/dance party held at the Sedgefield Country Club in Greensboro. Homecoming 1978 – King White #107 is named Brother of the Year. Spring 1979 – To celebrate the end of campus midterms (and to raise funds for the treasury), the chapter organizes a wildly successful ‘First Annual Miss Fido Birthday Party’ — a 30-keg, off-campus beer bash. The proceeds enable the chapter to host its Spring Banquet in Hilton Head, South Carolina. The banquet favor is a smoked highball glass with the Neese House etched in white. On campus, Dean of Student Affairs announces a forthcoming ‘Charter Review’ to scrutinize all of Elon’s Greek organizations. Summer 1979 – Due to concerns regarding the structural integrity of Neese House, the longtime college-owned facility is demolished by Elon College. Later, the property is conveyed to the Town of Elon to become site of its municipal building. 1979-80 – Chapter GS King White #107 serves as Elon’s SGA VP, Tony Lewis #115 serves as Senior Class President, and nearly a dozen chapter brothers serve in the SGA Senate. Fall 1979 – Elon College relocates Kappa Sigma two blocks north to Practice House — previously home to ITK (now the last remaining local fraternity on campus). Homecoming 1979 – 39 alumni return for the weekend for the first Homecoming celebrated at Practice House. A hot discussion topic at the Annual Meeting is LLHC’s intent to build or acquire and administer an off-campus fraternity house. Various local properties are on the wish list, yet all discussions are very preliminary in nature. Current expectations are that any such move to off-campus housing is at least three years away. Ideally, LLHC prefers to build a new house at a future Elon College ‘fraternity row’ located somewhere on college property; however, college officials have yet to disclose a specific timetable or location for on-campus housing designated for its Greek organizations. Spring 1980 – Ritch Branson #61 serves as President of Lambda-Lambda Alumni Association (LLAA). The EC led by GM Steve Coor #109 takes office. Mary Lib Moore is the Sweetheart. King White #107 receives the Brother of the Year award. April 1980 – During Spring Banquet weekend in the Pinehurst region of North Carolina, the chapter finds itself in hot water with the Southern Pines Sheraton Inn. Some members rearrange the letters on the roadside marquee to include a swear word greeting for the purpose of entertaining those riding the fraternity’s chartered buses to the evening’s offsite banquet. Because North Carolina Governor Jim Hunt also happens to be on the premises to address a ladies convention, what was intended as a humorous prank causes the chapter to face forced early checkouts per hotel management the next morning. Although the campus buzzes about the incident the following week and Elon president Fred Young is known to be well connected in the Sandhills region, the college authorities choose to not pursue formal action with the chapter in the semester’s waning days. June 1980 – King White #107 (now Director of Alumni and Parent Relations for Elon College) becomes President of the alumni association while serving as the chapter’s AA; Jack Locicero #111 serves as the chapter’s first Assistant Alumnus Advisor (AAA). 1981 – Keith Wells #133 is chapter GM; the chapter invites Mary Lib Moore to continue her role as the Sweetheart for another year. August 18-21, 1981 – Chapter delegate Jeff Russell #113 and alumni Tony Lewis #115 and King White #107 (AA) represent the Lambda-Lambda Chapter at the 53rd Biennial Conclave of Kappa Sigma in New Orleans, Louisiana. Fall 1981 – The direct telephone number for Practice House is 919-584-9003. LLHC’s 27244 zip code postal address is PO Box 838, and the chapter’s postal address is PO Box 911. October 30-31, 1981 – The Parents Weekend schedule of activities includes three activities held at the fraternity house: a Friday night mixer (brothers/dates), a ‘champagne and hors d’oeuvres’ pregame party, and a postgame party ‘with mixers provided’. November 13-15, 1981 – Homecoming chair John Vest #152 programs weekend festivities that include a Friday night house party and the Saturday morning LLHC meeting (conducted by LLHC President John Sealy #26) followed by pregame cocktails at the fraternity house. Multiple buses take the entourage to and from the Saturday night banquet/party held at Sedgefield Country Club in Greensboro where Joe Harrison #6 gators with the pledges. A Kappa Sigma alumnus of Hampden-Sydney serves as the disc jockey for the dance. On Sunday, brothers compete in an ‘alumni vs. undergraduates’ football game. Mike O’Brien #112 is named Brother of the Year. 1982 – Greg Blackburn #154 is the chapter GM, and Julie Talley is the Sweetheart. Spring 1982 – On its Alumni Weekend, Elon College presents its Young Alumnus of the Year award to Sigma Mu Sigma alumnus Bill Herbert (later to become Kappa Sigma initiate #852). To the consternation of many alumni, Lambda-Lambda Chapter schedules no Spring Banquet. June 1982 – Following his graduation from Elon, Jeff Russell #113 begins a two-year stint as Chapter Consultant for Kappa Sigma, thereby becoming the first Lambda-Lambda Chapter initiate to join the Kappa Sigma IMH team. Summer 1982 – The chapter receives IMH’s ‘Top Ten Chapter’ award — the highest recognition a chapter can earn — at the Kappa Sigma Leadership Conference in Charlottesville, Virginia. Conference attendees include GM Greg Blackburn #154 and GP Wendell Cocke #166. Kappa Sigma Chapter Consultant Jeff Russell #113 accepts the award on behalf of Lambda-Lambda Chapter. 1983 – Jay Paul #165 is the chapter GM; Dawn Denby is the Sweetheart. August 9-12, 1983 – At Kappa Sigma’s 54th Biennial Grand Conclave in Knoxville, Tennessee, Lambda-Lambda Chapter again earns IMH’s ‘Top Ten Chapter’ award. Chapter GM Jay Paul #165 is present to receive the award on behalf of the chapter. Fall 1983 – Chapter GM Jay Paul #165 is named recipient of a $250 scholarship-leadership award by IMH. October 1, 1983 – On Homecoming weekend, the chapter celebrates the 10th anniversary of founding with a dinner-party held at the Burlington Ramada Inn. The entire founding EC returns to campus. A very special guest is Kappa Sigma’s former chapter development officer, Bill Dorsey. Mementos of the event include a hard cover photo album containing portrait photos of all attendees published by Mark Smith #4 and a ceramic cup engraved with the names of all of the chapter initiates to date (#1 to #197). King White #107 receives the Alumnus of the Year award. 1984 – Keith Smith #182 is the chapter GM; Jan Azzarelli is the Sweetheart. ‘Delta House’, a rental property occupied by chapter brothers one block from Practice House, becomes a prime destination for the chapter’s unofficial social activities. April 24, 1984 – The chapter hosts its “The Final Bash for Miss Fido Hash” party at The Lighthouse for longtime chapter mascot, Fido. Now showing her age (plus the effects of nearly a decade of fraternity house living), Fido leaves Elon College for retirement in New Jersey under the care of Chris Bauman #147 following spring semester. Homecoming 1984 – King White #107 receives the Alumnus of the Year award. 1985 – Another canine, ‘Hydro’ assumes the role of chapter mascot. Chris Olsen #196 is chapter GM, and Annie Spaniol is the Sweetheart. Summer 1985 – For the third time in four years, Lambda-Lambda Chapter earns the “Top Ten Chapter” award from IMH. GM Chris Olsen #196 is named the GM of the Year, as well. Jimmy Zint #134 takes over as AA. 1986 – John Walker #214 is the chapter GM; Elizabeth Wirth is the Sweetheart. Spring 1986 – In the Scholarship Summary filed with IMH for the fall semester, the chapter’s GP and scholarship chairman Steve Hess #217 reports that Kappa Sigma ranks #5 out of the 7 Elon College fraternities; the undergraduate chapter’s GPA is 2.35, and the pledge class’s GPA is 2.64. 1987 – Jay Voorhees #230 is the chapter GM; Anita Butler is the Sweetheart. Fall 1987 – Mike Allen #224 begins his term as SGA Treasurer. Spring 1987 – To ease town-gown friction, Elon College announces plans to move the three fraternities (Kappa Sigma, Sigma Phi Epsilon, Sigma Pi) from the block they have shared with Elon Community Church for several years. John Davis #204 serves as the AA. Summer 1987 – Kappa Sigma’s Practice House is demolished during the summer break. Fall 1987 – Kappa Sigma is among several Greek organizations assigned to dormitory suites within Chandler Hall on Elon’s main campus. 1988 – Tommy Rogers #229 is the chapter GM; the Sweetheart is Sheli MacKay. Former Sweetheart Anita Butler receives the Alumni Service Award from Elon College. Fall 1988 – Rob Borgstrom #238 and Phil Murdock #274 begin their terms as SGA President and Vice-President. Homecoming 1988 – The 15th anniversary reunion year. 1989 – The chapter GM is Dann Worrell #279; the chapter invites Sheli MacKay to continue her role as the Sweetheart for another year. 1990 – The chapter GM is Jay Dodson #281; the Sweetheart is Susan Koser. Kathy Kern, Elon’s Assistant Dean of Student Life, serves as the chapter’s Faculty Advisor (1990-92). Fall 1990 – Elon College moves Kappa Sigma into one of the houses in the newly constructed Loy Center (dedicated on-campus residential housing for Elon’s Greek-letter organizations). Carter Smith #321 begins a term as VP of the Elon College SGA. December 10, 1990 – Carter Smith #321 is named recipient of a $250 scholarship-leadership award by IMH. 1991 – The chapter GM is Greg Gillette #319. Spring 1991 – Just before dawn the morning after the Brother-Pledge Party hosted by the pledge class, Elon College security finds two members of the pledge class unconscious next to the railroad tracks. This triggers serious concern by both the Elon administration and IMH. July 26, 1991 – During the Grand Conclave in Atlanta, Georgia, GP Carter Smith #321 and GT Art Dornik #323 represent Lambda-Lambda Chapter in a demand appearance before the SEC. Nearly two dozen chapter members appear with them in support. The chapter faces serious charges – allowing minors to consume alcohol in the fraternity house. Initially, the SEC votes to revoke the chapter’s Charter; then, the SEC agrees to give the undergraduates until the end of the weekend to return to them with a detailed plan of action to save the chapter. On Sunday, the chapter presents its restructuring plan which is then heavily modified by the SEC. The final conditions include a zero alcohol policy through fall semester and execution of multiple community service projects. The chapter is to deploy a scholarship improvement program and host a series of speakers’ forums on the subject of alcohol abuse. Documentation to support a substantially revised pledge program for fall semester and thereafter is required. An SEC member shall visit the chapter in fall semester to review the progress. Finally, the chapter is to undergo a follow-up charter review during an appearance before the SEC in February 1992. Fall 1991 – Carter Smith #321 begins a term as President of the Elon College SGA. Fall 1991 – SEC member Brian O’Dwyer pays a visit to the chapter to review the progress toward overall performance improvement. December 10, 1991 – Carter Smith #321 is named recipient of a $250 scholarship-leadership award by IMH. 1992 – The chapter GM is Scott McQueen #335; the Sweetheart is Paige Frazier. February 1992 – The Elon administration signals its respect and support for the chapter performance turnaround now underway by loaning an Elon College activity bus to transport chapter members to and from the SEC’s ‘show cause’ meeting in Atlanta, Georgia. The chapter’s officials stand before the SEC to present their report, and the top officers of Kappa Sigma receive the testimony given very favorably. Of the chapters so summoned by the SEC, Lambda-Lambda Chapter is singled out for praise for fielding such a large turnout of undergraduate members who came a great distance to stand alongside chapter officials to demonstrate the chapter’s unified commitment to Kappa Sigma Fraternity. Summer 1992 – Carter Smith #321 and Art Dornik #323 begin employment with Kappa Sigma IMH. Smith would serve as a chapter consultant until 1994. After a year as a chapter consultant, Dornik would serve another 3-1/2 years as Kappa Sigma’s director of chapter operations. 1993 – The chapter GM is Eddie Burleson #364; the chapter Sweetheart is Tiffany Luther. Bob McKinnon (a Sigma Mu Sigma brother) is named Elon’s Distinguished Alumnus of the Year. Dave Crafton #120 is the GM of the alumni association. Spring 1993 – In the most successful rush seasons in recent history, the chapter issues 23 bids with 22 men accepting. At the Bi-District Conclave, the chapter receives the ‘most improved chapter’ award. February 26, 1993 – The chapter hosts ‘Spring Alumni Weekend’ that draws two dozen alumni members. Activities included a bowling event at Country Club Lanes in Burlington, a formal/ritual meeting, and a cookout at the residence of Munroe Best #343 /Todd Martineau #354. Fall 1993 – On Homecoming weekend, the chapter celebrates the 20th anniversary reunion. From his RV parked just outside the entrance to Walter M. Williams Stadium, Tommy Dodd #126 hosts the Kappa Sigma pregame tailgate party. Elon College President Fred Young and his wife, Phyllis, host a postgame party honoring the fraternity at the President’s official residence (Maynard House). Worthy Grand Master (WGM) Wallace Bauman and Executive Director Mic Wilson represent IMH. Mementos include a clear 20th anniversary highball glass and a ‘Celebrating 20 years of Excellence’ t-shirt with chest pocket. 1994 – The chapter GM is Nick Psimas #400; the Sweetheart is Chantale Mackler. December 10, 1994 – LLAA formalizes its desire to establish a scholarship fund managed by Elon College as part of the institution’s endowment. In a filing document accepted by Elon College VP for Development Jo Watts Williams, the official name of this scholarship is “The Kappa Sigma Alumni Scholarship Fund” (account #3-3435-2000). The funds collected are to generate scholarship stipends to deserving Elon Kappa Sigma undergraduates who apply. At this time, Elon College rules require a $10,000 minimum corpus before the fund can qualify as an official institutional scholarship. Greg Blackburn #154 (later Kappa Sigma Scholarship chair of LLAA) makes the initial donation of $100. Elon College prescribes a deadline of December 31, 1999 for the fund to reach the $10,000 minimum; otherwise, all funds collected shall revert to Elon’s general scholarship fund. 1995 – The chapter GM is Chris Scango #428; the Sweetheart is November Salter. May 1995 – The chapter stages its Spring Banquet at Atlantic Beach, North Carolina. During the Friday night cruise aboard the head boat Capt. Stacy IV, as many as 18 passengers fall into Bogue Sound after a section of the vessel’s upper deck handrail breaks. Nine students are hospitalized with minor injuries and released. 1996 – The chapter GM is Lenny Smith #450; the Sweetheart is Erin Miller. Frank Lyon (Sigma Mu Sigma) is named Elon College’s Distinguished Alumnus of the Year. Carter Smith #321 begins volunteer service as a DGM for Kappa Sigma. 1997 – The chapter GM is Jay Pusey #446; the Sweetheart is Tira Stebbins. 1998 – The chapter GM is Brian Schenkemeyer #491; the Sweetheart is Brooke McAlees. Jay Butler #82, King White #107, Jack Locicero #111, and Fil Stidham #118 represent Kappa Sigma on Elon College’s National Alumni Executive Board. Homecoming 1998 – Elon College presents a Distinguished Young Alumnus award to Daniel C. Dollins #339. The Saturday evening celebration of the chapter’s 25th anniversary reunion takes place at Al’s Fine Foods. Late 1990s – Now that Kappa Sigma is housed in a suitable on-campus facility, LLHC takes steps to pivot from the original House Corporation objective of property acquisition and facility management. Moving forward, LLHC would serve as the structure to provide a ready source of funds to support the chapter and to underwrite alumni social activities such as Homecoming reunions. Dave Crafton #120 and Greg Blackburn #154 are the key alumni leaders during this period. 1999 – The chapter GM is Jason Alexander #482; the Sweetheart is Caitlin Reed. Summer 1999 – Tommy Dodd #126 serves as an Assistant DGM in District X (Eastern North Carolina). Fall 1999 – The chapter pledges 18 men and initiates 12. September 15, 1999 – Leo M. Lambert is inaugurated at Elon’s 8th President in ceremonies held in Alumni Gymnasium within Koury Athletic Center. Chapter alumni King White #107 and Carter Smith #321 as well as former chapter Sweetheart Anita Butler have the honor to be among nearly six dozen Elon College graduates who process in the ‘Long Maroon Line of Alumni’ during the ceremony. October 8, 1999 – Following an aggressive solicitation campaign by LLHC, the Kappa Sigma Scholarship Fund at Elon finally crosses the $10,000 minimum threshold, thereby becoming an officially recognized institutional scholarship – the very first scholarship to be endowed by an Elon fraternity or sorority. October 29-31, 1999 – At the annual meeting during Homecoming weekend, Jay Butler #82 becomes LLHC GM. The LLHC Board agrees to begin hosting semi-annual meetings at Elon and begins publishing annual financial statements for distribution. 2000 – The chapter GM is Neal Harrington #505; the Sweetheart is Courtney Reynolds. Jimmy Simmons #47, a broker with Paine Webber, manages the invested assets of LLHC. Spring 2000 – A series of on and off campus incidents in recent years severely test the patience of Elon officials. By this semester, the chapter has been suspended by Kappa Sigma’s Supreme Executive Committee (SEC), and the SEC has reached its limit of toleration. Word has it that the SEC is poised to revoke the charter of Lambda-Lambda Chapter during its scheduled May meeting in Tampa, Florida. May 2000 – The daughter (an Elon junior and sorority member) of Gary Evans #1 briefs her father on Kappa Sigma’s dire situation. Evans, who lives in North Palm Beach, drives across Florida to attend the SEC’s meeting. Speaking as the chapter’s founding GM, Evans delivers a passionate appeal that the SEC forego revocation proceedings and instead continue the chapter’s “probation” status while chapter alumni take steps to assert corrective action. After a brief private huddle, the SEC members agree to grant Evans’ request. The SEC continues the chapter’s suspension and appoints Todd Ward (DGM-Western NC) to form a local Alumni Board of Control (ABC) to supervise chapter operations until further notice. In closing comments, the SEC speaks to the severity of the situation by noting bluntly that the charter of Lambda-Lambda Charter most certainly would have been revoked had Evans not joined their meeting that day. Summer 2000 – The 8-member team assembled by DGM Ward to serve as the ABC includes chapter alumni Tait Arend #391 (AA), Gary Evans #1, Scott McQueen #335, and Rusty Michael #324 plus undergraduate chapter GM Neal Harrington #505. They are joined by three Kappa Sigma alumni from other North Carolina chapters, each of whom either currently serves or has served as a Kappa Sigma DGM/ADGM. The ABC meets regularly on and off campus and via conference calls. Eventually, Evans becomes the de facto head of the ABC. The series of ABC meetings continues through the fall semester. 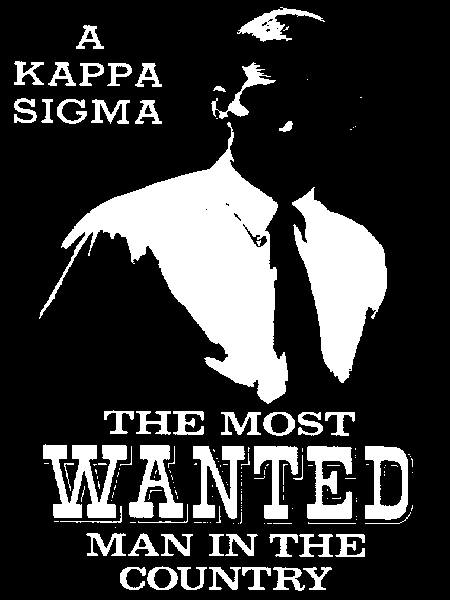 Fall 2000 – The ABC convenes membership reviews involving individual interviews for the purpose of determining which undergraduates are sufficiently fit and committed to continue their active membership in Kappa Sigma. Homecoming 2000 – At the annual meeting, many among the two dozen returning alumni express concern for the chapter’s tenuous situation. DGM Todd Ward is present to field questions regarding the ongoing work of the ABC. To these alumni members, it is a hot issue that a significant portion of the alumni organization’s treasury fund has been spent on curing symptoms of the chapter’s ongoing pattern of irresponsible behavior in recent years. LLHC GM Jay Butler #82 notes that, since its inception, the House Corporation has invested more than $17,000 in the local chapter through a combination of loans and grants. Additional concerns are raised about the chapter’s recent failure to pay the required $10 per semester per undergraduate dues to the House Corporation treasury as required by the LLHC Bylaws. The gathered alumni vote to formally schedule LLHC’s annual meeting on the Saturday morning of Homecoming weekend. In another vote, LLHC increases the undergraduate dues fee from $10 per member per semester to $15 per member per semester. The LLHC Board selects Gary Evans #1 as Lambda-Lambda Chapter’s Alumnus of the Year for being so engaged in the ABC process that preserved the Charter. Butler is re-elected GM of LLHC, and Greg Blackburn #154 is elected GM of the LLAA. GM Neal Harrington #505 becomes the first recipient of the Kappa Sigma Scholarship. Late Fall 2000 – The chapter tallies a cumulative GPA of 2.83 – this places Kappa Sigma second among the eight Elon fraternities. The undergraduate chapter totals approximately 55 members. 2001 – Elon College invites LLHC GM Jay Butler #82 to join the institution’s Board of Visitors. Trey Stewart #322 joins the Elon College staff as the Director of Athletic Development. April 2001 – The chapter’s Sweetheart is Jen Long. After nearly a year of hard work by a team of alumni and undergraduate chapter members, and with a newly installed EC led by GM Taylor Barnes #533 in place, the ABC agrees to dissolve. Thereafter, LLHC shall exist as the alumni body with overall responsibility for chapter oversight. The AA and AAAs shall play critical roles regarding ongoing/tactical oversight. The chapter is restored to normal operations. Two key lessons learned from the grueling ABC process: 1. Alumni engagement literally saved the chapter, and 2. Active/ongoing alumni involvement to guide the chapter shall be needed forever. April 28, 2001 – The chapter’s Faculty Advisor, Rex Waters, is formally initiated into Kappa Sigma by Lambda-Lambda chapter. He becomes initiate #547. Summer 2001 – LLHC GM Jay Butler #82 reacquires the original LLHC treasury files — records which have been considered lost for several years. In order to start fresh, Butler opens a new treasury bank account in LLHC’s name and transfers the assets into it. Moving forward, the LLHC and LLAA shall operate as two separate entities sharing a common treasury account (that of LLHC). There is no longer a need to raise funds to purchase/operate a fraternity house; hereafter, any funds raised shall be earmarked for Homecoming reunions and initiatives that support our undergraduate chapter and alumni body. November 9-11, 2001 – During the Homecoming annual meeting, LLHC endorses plans to make a 5-year commitment to sponsor two reserved seats with identity plaques in the newly opened Rhodes Stadium on the Elon campus. Jay Butler #82 is re-elected GM of LLHC, and Jay Dodson #281 is elected GM of the alumni association. The LLHC Board honors Butler as the Alumnus of the Year. 2002 – The chapter GM is Jay Musser #536; the Sweetheart is Lindsay Allman. On campus, Elon College officially becomes Elon University. July 27-28, 2002 – The chapter receives a scholarship award at the Kappa Sigma Area II Leadership Conference in Greenville, South Carolina. Chapter attendees are GM Jay Musser #536, Jeff Holland #557, Grant Rash #552, Chad Melroy #535, and Jason Hall #545. November 8-10, 2002 – During the LLHC annual meeting at Homecoming, alumni vote to eliminate the redundant positions of GMC, GS and GT for LLAA. Greg Blackburn #154 is elected GM of LLHC, and Jason Knight #408 is elected the sole officer of LLAA (GM). LLHC GS King White #107 is selected as Lambda-Lambda Chapter’s Alumnus of the Year. Blackburn announces that a plaque featuring the names of the Alumnus of the Year from 2000 forward shall be purchased for perpetual display at the chapter house. 2003 – The chapter GM is Will Frolich #556; the Sweetheart is Kate Glassnapp. Elon University invites Carter Smith #321 to join Elon’s National Alumni Board. November 7-9, 2003 – The 30th anniversary reunion on Homecoming weekend features a well-attended Friday golf tournament at Stoney Creek Golf Club. The entire founding EC returns to campus. At least 7 former Sweethearts join alumni and undergraduates for the Saturday evening dinner-dance party at the Ramada Inn’s Convention Center. The LLHC Board selects LLHC GM Greg Blackburn #154 as Lambda-Lambda Chapter’s Alumnus of the Year. Carter Smith #321 begins a term as LLHC GM. The recipients of the Kappa Sigma Scholarship are Peter Donohoe #569, Jason Purvis #559, Grant Rash #552, Jared Rudolph #582, Eric Thorp #596, and Robert Tucker #597. 2004 – The chapter GM is David Weber #580; the Sweetheart is Betsy Johnson. October 2004 – During the pledging period, an early Sunday morning, single-car accident hospitalizes pledge Nathan Copeland (he would become initiate #652) with minor injuries. The incident and subsequent investigation draws significant scrutiny to chapter operations. Additionally, the chapter falls well below the all-men’s and all-fraternities academic averages. The University prescribes sanctions to stand in effect through the 2005 fall semester. Homecoming 2004 – Carter Smith #321 is re-elected LLHC GM and is named Lambda-Lambda Chapter’s Alumnus of the Year. Alumni present vote to eliminate all LLAA officers as redundant/unnecessary, effectively ending the increasingly ineffective dual organization structure. As a fundraiser, the chapter markets to the alumni a well-received embroidered beer can hugger that bears the Kappa Sigma letters and Homecoming date. 2005 – The Sweetheart is Morgan Allen. Spring 2005 – The University prescribes additional penalties for the chapter’s failure to abide by the sanctions handed down in October; even worse, there are new allegations that hazing practices continue. The chapter is suspended by IMH and held liable for a $10,000 fine, and Weber is ordered to step aside as GM. He is replaced in office by Mark LaPierre #592. All the leadership chaos and tension creates a major crisis of confidence among chapter membership. Chapter morale falls so low that undergraduates – including the Pierre-led EC – give serious consideration to allowing the chapter to close rather than forcing current membership to endure the overwhelming burden of sanctions. This is the closest Lambda-Lambda Chapter has come to closure since May 2000. In response to the real threat that the undergraduate members might allow the chapter to wither away, nearly a dozen alumni join the undergraduates at a critical chapter meeting to encourage their chapter brothers to stick it out. Afterward, chapter GM LaPierre and his EC make the critical decision to stay in office. A formal Membership Review prescribed by IMH and facilitated by the chapter’s alumni adviser team expels twelve members from the brotherhood. Summer/Fall 2005 – LLHC raises over $14,500 from chapter alumni to settle the chapter’s debt to IMH, and the alumni body recommits to mentoring the undergraduate chapter. This generous raise, the renewed outpouring of engaged support by alumni working with newly appointed leaders, and the inspired leadership of Mark LaPierre #592 and his EC have combined to preserve the very Charter of the Elon University chapter of Kappa Sigma. Homecoming 2005 – Wanda & Les Hall #56 execute the latest in their series of well-received pregame tailgate parties. Janine & Ron Osborne #96 host a postgame party for ‘Neese House Gang’ members at their home on Saturday night. The LLHC Board selects outgoing LLHC GM Carter Smith #321 as Alumnus of the Year. Zene Fearing #62 takes over as LLHC GM. January 2006 – LLHC GM Zene Fearing #62, Barry Baker #11, Perry Black #103, Gary Evans #1, Carter Smith #321, and Faculty Advisor Rex Waters #547 join 34 undergraduate members for a formal ‘steering committee’ meeting at the chapter house. This alumni-undergraduate meetup is designed to add to the positive momentum now underway and set the tone for a productive spring semester ahead. February 2006 – The chapter, now led by GM Alex French #604, votes to sanction five fellow brothers for violating the chapter’s alcohol-free status during Winter Term. Officials of LLAA, the University, and IMH officials view this responsible gesture as a sign that the chapter (still in the throes of significant disciplinary action) is treating the sanctions with the appropriate level of seriousness and professionalism. Spring 2006 – DGM Jon Bowman presents a ‘Certificate of Ritual Proficiency’ to Bryan McMinn #607, Andrew Feldman #644, Joseph Saladino #672, David Coulter #641, Sean Hetherington #647, Chris Eydt #642, Jonathan Isley #648, and Graham Rountree #649. Alumni advisors who participate in the weekly chapter meetings are Carter Smith #321, Barry Baker #11, Mike Driskill #241 and Perry Black #103. The chapter breathes a sigh of relief after Greek Life informs the chapter that the present campus residential assignment for Kappa Sigma (the Loy Center House) shall be continued next semester. July 28-30, 2006 – Undergraduates Colby Hart #646, Chris Farnsworth #643, and Joe Saladino #672 attend the Kappa Sigma Leadership Conference in Cincinnati, Ohio. The LLHC treasury pays for the flights of these members to participate. September 16, 2006 – For Parents Weekend, the undergraduate chapter hosts a successful and well-attended father-son golf outing organized by Peter Gutschenritter #627. On Saturday, the family of Alston Team #610 hosts a pig pickin’ for the chapter; Elon University President Leo Lambert and members of the faculty are special guests. November 3-5, 2006 – At least 34 alumni return for Homecoming. The LLHC Board selects Barry Baker #11 as Lambda-Lambda Chapter’s Alumnus of the Year. Zene Fearing is re-elected GM of LLHC. Wanda & Les Hall #56 reprise their roles as hosts of Kappa Sigma’s pregame tailgate party. The postgame party is at West End in downtown Elon. The recipients of the Kappa Sigma Scholarship are Sean Barry #634, David Coulter #641, Christopher Farnsworth #643, and Bryan McMinn #607. Fall 2006 – The chapter’s cumulative GPA rises from 2.85 to 2.95. 2007 – The chapter GM is John Washington #632; the Sweetheart is Elizabeth Colquitt (her father was initiated into Kappa Sigma at another campus). June 3, 2007 – The alumni association website with domain name “www.KappaSigmaElon.org” is acquired by LLHC GS King White #107. June 2007 – A PayPal account for LLHC is established by King White #107 and managed thereafter by LLHC GT Tony Lewis #115. July 1, 2007 – The alumni website KappaSigmaElon.org is launched by LLHC GS King White #107. Summer-Fall 2007 – Mac Lewis #20 begins the painstaking process of transcribing the handwritten ‘Initiation Roll Book’ curated by the chapter Grand Scribe (GS) into an electronic spreadsheet file that can become accessible to all members online. The LLHC Board votes to convert the outdated LLHC from a ‘house corporation’ to an ‘alumni association corporation’. LLHC GT Tony Lewis #115 is empowered to facilitate the requisite legal and accounting steps (an arduous process that is expected to take two years or more). Summer 2007 – Undergraduates Jay Donovan #659, Anthony Saladino #672, Chris Knapp #664 and alumni Zene Fearing #62, Gary Evans #1, Jay Butler #82 represent Lambda-Lambda Chapter at Kappa Sigma’s 66th Biennial Grand Conclave in Miami, Florida. September 20, 2007 – IMH grants the official Charter for the newly constituted Lambda-Lambda Alumni Association. The milestone event makes the “Lambda-Lambda Alumni Association of the Kappa Sigma Fraternity” an official alumni association of Kappa Sigma Fraternity, and it represents the culmination of many months of dedicated effort by Gary Evans #1. Homecoming 2007 – Spurred by grief at the untimely death of John Merkel #171, brothers from his Practice House era mobilize to organize the so-called “34th anniversary reunion”. They are very successful attracting a sizable turnout for an off-year Homecoming. The weekend starts on Friday with a golf tournament at Stoney Creek Golf Club. Wanda & Les Hall #56 execute yet another well-received pregame tailgate party in the Harper Center parking lot. A DJ dance-party at the Best Western on Saturday night organized by Eric Cuthbert #172, Gus Payne #65, and Chris Olsen #196 attracts a big crowd that includes a contingent of late-1970s ZTA alumnae who’re celebrating a sorority mini-reunion. Gary Evans #1 orchestrates the ‘safe rides’ initiative that provides complimentary shuttles between the hotels and the Saturday evening party. LLAA GM Fearing #62 presents special ‘Grand Master Awards’ to Evans, Rex Waters #547, King White #107, Wanda & Les Hall #56, and LLHC GT Tony Lewis #115. Fearing is named Alumnus of the Year. Perry Black #103 takes over as the GM of LLHC. Christopher Farnsworth #643 is named the sole recipient of the Kappa Sigma Scholarship (his second honor in two years). December 10, 2007 – The alumni membership formally votes to ratify the Bylaws of LLAA (the organization that is to replace LLHC). 2008 – The chapter GM is Jim Frisch #645; the Sweetheart is Rebecca Porter-Orr. July 2008 – IMH recognizes the chapter with its first Founders’ Award of Chapter Excellence award – the second highest honor a chapter can achieve. GM Jim Frisch #645 accepts the F.A.C.E. award on behalf of the Lambda-Lambda Chapter at Kappa Sigma’s East Leadership Conference in Richmond, Va.
Fall 2008 – Jay Butler #82 leads an aggressive dues campaign as a prelude to the 35th anniversary reunion. The fundraiser reaps $16,586 for the LLAA general operating fund, thereby becoming the most successful campaign in association history. November 7-9, 2008 – The 35th anniversary reunion at Homecoming features the largest overall turnout of initiates to date. Forty-nine Kappa Sigmas participate in the Friday afternoon golf tournament at Stoney Creek Golf Club. During the Friday night ‘Neese House Gang’ party hosted at the home of Janine & Ron Osborne #96, guests take turns chatting with US Navy Vice Admiral Bill Gortney #50 via Skype from his base at US 5th Fleet Headquarters in Bahrain. The evening goes long at a packed party at the chapter house which features a live band. The Saturday pregame tailgate party coordinated by Les Hall #56 is the most expansive to date. The weekend culminates at the Ramada Inn Convention Center with a dinner program and dance featuring a live band. Kappa Sigma Worthy Grand Master of Ceremonies (WGMC) Christian Nascimento, Executive Director Mic Wilson, and DGMs Jason Anderson and Greg Hunt represent IMH. Mementos include a commemorative hat. As a side fundraiser, Jay Butler #82 sponsors the raffle of a Kappa Sigma Star and Crescent jewel pin. Perry Black #103 is feted as Lambda-Lambda Chapter’s Alumnus of the Year. Jim Frisch #645 is named sole recipient of the Kappa Sigma Scholarship. Spring 2009 – Tyler Graham #662 completes his term as chapter GM; the Sweetheart is Anna Lamback. May 29, 2009 – The State of North Carolina recognizes the LLAA as a 501(c)(7) corporation. The founding GM of LLAA is Perry Black #103. August 2009 – King White #107 acquires and manages the @KappaSigmaElon Twitter handle for LLAA. Fall 2009 – The EC led by Thomas Duncan #681 takes office. Chuck Griffith #653 becomes the Alumnus Advisor. October 24, 2009 – The LLAA membership formally votes to dissolve LLHC. Homecoming 2009 – For this off-year reunion, LLAA elects to partner with ZTA as the sorority organizes a mini-reunion of their 1970s/80s alumnae. Both groups host a combined tailgate party and a DJ party at the Best Western after the football game. GM Perry Black #103 presents the ‘Grand Master Award’ to King White #107. The LLAA Board honors Tony Lewis #115 as Lambda-Lambda Chapter’s Alumnus of the Year. Nathan Copeland #652 takes over as LLAA GM. Announcement is made that Bill Gortney #50 has been selected as the recipient of Kappa Sigma IMH’s coveted ‘John Tower Distinguished Alumnus Award’. Unable to attend Elon’s Homecoming, Gortney shall receive his award at an event set for later this fall. Tyler Graham #662 is the recipient of the Kappa Sigma Scholarship. November 4, 2009 – The State of North Carolina formally recognizes the decision to dissolve LLHC. Hereafter, LLAA serves as the chapter’s sole alumni organization. November 20, 2009 – At a special event held in Virginia Beach, Virginia attended by numerous chapter alumni, guests, and family members, Navy Vice Admiral Bill Gortney #50 receives Kappa Sigma Fraternity’s ‘John G. Tower Distinguished Alumnus Award’. Gortney becomes the first Lambda-Lambda Chapter initiate to receive international recognition by Kappa Sigma. The IMH’s Executive Director Mic Wilson is among the evening’s speakers. Late November 2009 – The University and IMH each level sanctions on the chapter for various infractions revealed to have occurred just before Homecoming weekend. The majority of the offences involve activities hosted at the Tapscott house (the unofficial, off-campus fraternity house). 2010 – Following a formal investigation into the allegations regarding the Tapscott house (a situation which had led to suspension of the chapter in November 2009), chapter GM Thomas Duncan #681 is required to stand down from his office. To stabilize the situation, the immediate past chapter GM Tyler Graham #662 agrees to return and serve as interim GM until new officers are elected. March 2010 – Following special officer elections, the chapter elects a new EC led by Dave Pullman #711. Maggie Landy is the Sweetheart. Fall 2010 – Controversy surrounding a campus flier (featuring photos of Kappa Sigma members at the Tapscott house paired with “1. How to dress like a bro. 2. How to drink like a bro. 3. How to pass out like a bro.”) further increases the level of negative attention on the chapter. The chapter faces increased scrutiny regarding the its off-campus activities. September 2010 – LLAA GM Nathan Copeland #652 agrees to add the role of AA to his responsibilities. He replaces AA Chuck Griffith #653 who recently moved out of the area. Homecoming 2010 – For this off-year reunion, LLAA partners with Tri-Sigma as the sorority celebrates its 40th reunion. The groups co-host a uniquely festive tailgate party. Following an informal postgame cocktail party at Best Western’s Grill 584, Kappa Sigma is a welcome guest at Tri-Sigma’s post-dinner dance party at the Ramada Inn. LLAA underwrites a complimentary shuttle service between the Best Western and the Tri-Sigma event. The LLAA Board recognizes longtime Faculty Advisor Rex Waters #547 as Lambda-Lambda Chapter’s Alumnus of the Year. Luke LeSourd #727 is the recipient of the Kappa Sigma Scholarship. December 6, 2010 – As Elon officials continue to express grave concern to the chapter’s alumni advisors regarding the continuing pattern of unapproved behavior by certain fraternity members who reside off campus at the Tapscott house, in a letter addressed to GM Dave Pullman #711, the chapter receives word that it has been returned to ‘good standing’ by the Kappa Sigma SEC. 2011 – Drew Malay #709 succeeds Pullman as GM. The Sweetheart is Alex Hanner. May 20 2011 – Alumni and undergraduates gather in Johnston Hall on the Elon University campus for a special breakfast meeting to honor Vice Admiral Bill Gortney #50. Kappa Sigma Worthy Grand Scribe (WGS) Greg Hunt is among those present. During the program, LLAA announces the establishment of a new alumni award — the “William E. Gortney Distinguished Alumnus Award”. May 21, 2011 – Bill Gortney #50 delivers the 2011 Commencement address at Elon University. Homecoming 2011 – For this off-year reunion, LLAA partners with ZTA and Phi Mu to help both sororities celebrate their respective 40th reunions. The three groups co-host the tailgate party, and Kappa Sigmas are honored guests at the sororities’ dinner-dance at the Ramada Inn. The LLAA Board selects King White #107 as Alumnus of the Year. Mike Allen #224 takes over as LLAA GM. Ryan Kilbane #707 is the recipient of the Kappa Sigma Scholarship. October 2011 – Elon University places the chapter on disciplinary probation as a consequence of infractions discovered to have occurred during the previous semester’s Spring Banquet. The university reviews the chapter’s less than flattering “conduct history and precedent over the past few years”; it prescribes a number of sanctions including suspension through May 2012. In response to the University action, IMH suspends chapter operations pending further investigation. November 7, 2011 – In reaction to the precarious situation in which it finds itself, the chapter chooses new leaders in a special election to replace the current EC. The new GM is Andy Fargonoli #725. January 2012 – The University informs the chapter that its privileges to reside in the current Loy Center house shall not be renewed after the spring semester. Elon’s chapter of Kappa Sigma has called this Loy Center full house its home since 1990, so this news is a significant disappointment for everyone involved. February 2012 – The University offers the chapter a much smaller residential space in the Loy Center multiplex building that is designed to house multiple Greek organizations. The offer involves a two-year placement set to last through spring semester 2014. (During the 2013-14 academic year, all Greek organizations shall submit housing applications for 3-year terms.) The chapter has no real option but to accept the offer. March 7, 2012 – The University places the chapter on suspension pending an investigation into members’ inappropriate treatment of pledges (a potential hazing violation). Immediately, IMH follows suit. March 20, 2012 – Based on an investigation report filed by Kappa Sigma DGM John Stallings, the Kappa Sigma SEC reinstates the chapter with orders for the chapter to formally prosecute the individual member(s) responsible for the hazing incident. Fall 2012 – The chapter begins its first academic year based in a Loy Center multiplex residence that includes other Greek organizations. Because the new fraternity house is not a detached home like the former quarters, the new space is known colloquially as a ‘half house’. Hannah Berg is the chapter Sweetheart. September 13, 2012 – An incident at Tapscott house (by now the chapter’s notorious, unofficial off-campus social house) draws the Town of Elon police department and the NC department of Alcohol Law Enforcement. Strong sanctions follow formal investigations by University officials and by DGM John Stallings. December 2012 – IMH announces Bill Gortney #50 as its next recipient of Kappa Sigma’s international ‘Man of the Year’ award. December 10, 2012 – At Kappa Sigma’s annual Founders Day Dinner in Washington, DC, Gary Evans #1 receives IMH’s John G. Tower Award – the second initiate of Lambda-Lambda Chapter to receive this prestigious honor. December 20, 2012 – The chapter is served notice that the investigations regarding the September 13 incident do confirm chapter violations of Kappa Sigma’s Code of Conduct. The SEC applies new sanctions and restrictions that are to continue through the balance of the academic year. Spring 2013 – The chapter elects and installs James Dorsett #743 to follow Andy Fargonoli #725 as GM; the Sweetheart is Chelsea Meade. To foster a better chapter oversight environment and to improve undergraduate-alumni communications, the alumni advisory team begins executing a transition plan that pairs LLAA officers with their chapter EC counterparts. July 30, 2013 – A cost-free iContact email distribution account for LLAA is established by King White #107. The platform replaces the “ElonLLalumni” Yahoo group list that has been utilized by the alumni organization since the summer of 2000. Homecoming 2013 – On Friday, Bill Gortney #50 receives the Distinguished Alumnus of the Year Award from Elon University (King White #107 provides the introduction). The fraternity hosts its pregame tailgate party under a huge tent facilitated by University officials. On Saturday evening, a combined event celebrating the chapter’s 40th anniversary reunion and the Kappa Sigma Man of the Year Award culminates at the Ramada Inn Convention Center with a dinner program and dance. Reunion mementos include an engraved ceramic coffee mug and an engraved wine glass. Special guests include Smith Jackson (Vice President for Student Life and Dean of Students at Elon University). Also present to represent IMH office: WGMC Toby Taylor, WGS Greg Hunt, and Executive Director Mic Wilson. The LLAA Board honors John Hill #57 as the first winner of the “William E. Gortney Distinguished Alumnus Award” (Gortney Award). Zene Fearing #62 receives the Alumnus of the Year award. Neil Lindley #334 takes over as LLAA GM. Yale Hoffberg #758 is the recipient of the Kappa Sigma Scholarship. 2014 – Yale Hoffberg #758 is the chapter GM; Katherine Saffelle is the Sweetheart. Spring 2014 – Elon’s Greek housing policy prescribes 3-year assignments. Accordingly, this is the year the chapter submits its application to seek promotion from the existing ‘half-house’ to a full-size house in the Loy Center. The timing could not be worse. As a consequence of the chapter’s ongoing performance issues (further complicated by an ongoing investigation about yet another incident at Tapscott house), the request is denied by Greek Life. The chapter shall remain housed in Loy Center “J” for an additional three years — through spring 2017. Apr 2014 – Nearly two dozen members are dealt one-year suspensions or expelled after an investigation leads to another formal Member Review. This action is taken after IMH and the University suspend the chapter for code of conduct violations involving unsavory activities at the chapter’s off-campus social house (Tapscott house) that had been revealed just prior to Homecoming 2013. 2015 – Jack Zaykowski #784 is the chapter GM. Stuart Sioussat, a Kappa Sigma who resides in Burlington, North Carolina, begins supporting the chapter as AA. A former DGM, Sioussat is a 1986 graduate of UNC-Wilmington and an initiate of its Mu-Zeta Chapter. March 2015 – Chapter brothers and pledges are cited for trespassing by police during a road trip to visit the Abington, Virginia gravesite of Kappa Sigma founder Stephen Alonzo Jackson. Initially, the incident prompts the University and IMH to suspend the chapter. The subsequent investigation reveals no malice of intent, and the suspension is lifted. April 3, 2015 – Greek Life invites the chapter to increase its residential footprint by expanding into “Loy K” – this in addition to their existing quarters at “Loy J”. The chapter respectfully declines the offer, opting instead to strive for reassignment into a full house after fall semester 2016. Homecoming 2015 – The LLAA Board honors Casey Beathard #236 (Gortney Award) and Neil Lindley #334 (Alumnus of the Year). Kevin Flynn #318 takes over as LLAA GM. John Zaykowski #784 is the recipient of the Kappa Sigma Scholarship. 2016 – The chapter’s EC is led by GM 2016 Joe Lana #796. Katie Ginsberg is the chapter Sweetheart. Spring 2016 – The chapter applies for reassignment to one of the full-size houses in Loy Center. As a consequence of significantly improved chapter performance, Greek Life endorses the application. This marks Kappa Sigma’s last semester of five years in quarters known as the “half-house”. August 4, 2016 – By way of special initiation, Sigma Mu Sigma brother Bill Herbert (Elon ’68 and Elon University Board of Trustees Chair) formally joins the Lambda-Lambda Chapter of Kappa Sigma as its 852th initiate during a ceremony conducted by a ritual team at Kappa Sigma headquarters in Charlottesville, Virginia. Fall 2016 – Now boasting a very strong reputation with both campus officials and IMH, Lambda-Lambda Chapter settles into its new quarters in Loy Center (a different yet newer full-size house than the one the chapter first occupied in 1990). Ruthie Robinson is the chapter Sweetheart. Homecoming 2016 – The LLAA Board honors Bill Herbert #852 (Gortney Award) and Doug Frain #269 (Alumnus of the Year). 2017 – IMH recognizes the chapter with its second F.A.C.E. award (Founders’ Award of Chapter Excellence). The chapter’s EC is led by GM 2017 Brett Ebel #813. April 2017 – During its spring pledge class initiation ceremony, the chapter conducts a formal initiation of Sigma Mu Sigma brother Bill Onufrak (Elon ’68). July 17, 2017 – Casey Beathard #236 receives IMH’s John G. Tower Award – the third initiate of Lambda-Lambda Chapter to receive this prestigious honor. Fall 2017 – Lambda-Lambda Chapter founder Joe Barbee #10 donates his pro-quality billiards table to the chapter; it arrives for setup in time for display at Homecoming. Lexi Buchanan is the chapter Sweetheart. Homecoming 2017 – Garrett McKnight #806 receives Elon University’s ‘Distinguished Service to Elon’ award. The LLAA Board honors Jason Knight #408 (Gortney Award) and Mike Allen #224 (Alumnus of the Year). Trey Foy #389 takes over as LLAA GM. Sam Olson and Devon Barnes receive Kappa Sigma Scholarships. November 2017 – Kappa Sigma appoints Carter Smith #321 as DGM for the Central NC/Triangle district – a territory that includes the Lambda-Lambda Chapter. 2018 – Amanda Granath is the chapter Sweetheart. April 27, 2018 – The chapter celebrates its Spring Banquet in Myrtle Beach, South Carolina. However, the otherwise incident-free weekend is marred by the undergraduates being accused of impersonating a student group from a fellow Colonial Athletics Association university to hotel officials. IMH formally suspends the chapter pending an investigation led by DGM Carter Smith #321. The IMH suspension is lifted after the investigation reveals little more than errors of judgement made by individual chapter members. For the trespasses, the chapter receives several sanctions: a monetary fine, a requirement to appear before the SEC at the upcoming Leadership Conference, and a requirement that the chapter facilitate a District Conclave at Elon in fall semester. Chapter leaders anticipate scrutiny by Elon officials upon their return to campus in fall semester. Fall 2018 – LLAA GS Mark Novey #248 launches the WordPress revamp of LLAA’s website (kappasigmaelon.org). This comprehensive, attractive redesign which includes additional content and many new features represents the first across-the-board redesign of the site since its launch in 2008. Novey also replaces the iContact platform (utilized by LLAA for sharing communications via email to alumni) to the Mailchimp platform and acquires the Instagram account @KappaSigmaElonAA. Mike France #136 and Joe Harrison #6 accept appointments to serve as Assistant Alumnus Advisors of the chapter. Over the summer and into the fall semester, the chapter satisfies the sanctions previously prescribed by IMH. At the end of fall semester, the alumni advisory team is comprised of AA Stuart Sioussat plus three AAAs: France, Harrison, Barry Baker #11, and Carter Smith #321. September 2018 – The chapter receives a summons from Elon’s Office of Student Conduct to appear at a hearing to review potential violations of the University’s Code of Conduct related to the April 27 Spring Banquet incident. September 17-October 19, 2018 – LLAA conducts a unique fundraiser to meaningfully increase financial support of the Kappa Sigma Scholarship at Elon University. Les Hall #56 creates pen & ink sketches of the chapter’s four legendary fraternity houses, and qualifying donors to the fund are to receive one of four commemorative prints: Neese House as it was in the 1960s when it held Sigma Mu Sigma, Neese House as it was under Kappa Sigma in the 1970s, Practice House (1979-87), and the first Loy Center house (1990-2012). October 18, 2018 — Connie LeDoux Book, is inaugurated at Elon’s 9th President in ceremonies held at Elon’s brand new Schar Center. Mark Smith #4, King White #107, Thad Gulliford #333, and LLAA GM Trey Foy #389 have the honor to be among the 69 graduates who process in the ‘Long Maroon Line of Alumni’ during the ceremony. October 1, 2018 – Following a hearing conducted by Elon’s Office of Student Conduct, the chapter receives word that it is subject to discipline for conduct that occurred at its recent Spring Banquet. The sanctions include: a) Disciplinary Probation through June 1, 2019, b) a requirement to create a Chapter Standards Board by November 2, c) a requirement to host and underwrite three workshops facilitated by Dr. Aaron Bachenheimer (Executive Director, Off-Campus Student Life & Community Partnerships at UNC-Chapel Hill) by December 7, and, d) a requirement for the chapter to appear at a scheduled meeting with Elon University President Connie Ledoux Book in Spring 2018. Additionally, through June 1, 2019, Kappa Sigma is forbidden from holding or hosting any social activities that involve an overnight stay (Spring Banquet, etc. ); in general, the chapter is restricted to holding or hosting organized events within 50 miles of the campus. Homecoming 2018 – This is the 45th anniversary reunion year. Elon University officials credit the alumni of Kappa Sigma for donating a combined total of more than $151,000 to alma mater during the year leading to its milestone reunion. LLAA’s ‘Kappa Sig house sketches’ campaign draws about $8,000 into the Kappa Sigma Scholarship fund via three dozen individual gifts. The top donors who earn rights to the original sketches (created for the campaign by Les Hall ‘56) are Chip H. Saunders ‘66 (Sigma Mu Sigma/Neese House), Bill Gortney #50 (Kappa Sigma/Neese House), John McFadyen #219 (Practice House), Carter Smith #321 (Loy Center house). As of November, 2018, the value of the Kappa Sigma Scholarship approaches $75,000. At Elon University’s Homecoming awards luncheon on Friday afternoon, the institution honors Carter Smith #321 with its ‘Distinguished Service to Elon’ Award (King White #107 provides the introduction). The Lambda-Lambda Chapter celebrates its 45th anniversary with all events hosted on or around the Elon campus. Reunion hats in three designs are popular reunion keepsakes. Friday’s program includes a Friday afternoon golf tournament involving nearly a dozen Kappa Sigmas held at Alamance Country Club, a guided tour of the recently opened Schar Center, and a BBQ dinner-party on the chapter house grounds in the Loy Center neighborhood. At dusk on Friday, the evening’s agenda is impacted by a severe rain event, but beautiful fall weather prevails for the weekend. On Saturday morning, the respective Executive Committees of the chapter and LLAA convene the fraternity’s annual ritual meeting in LaRose Digital Theatre at Koury Business Center. There, LLAA announces its 2018 honorees (Nick Dyer #682 [Gortney Award] and LLAA GS Mark Novey #248 [Alumnus of the Year]). LLAA Scholarship Chair Greg Blackburn #154 announces junior undergraduate Sam Olson #877 as the 2018 recipient of the Kappa Sigma Scholarship — the monetary award of $4,500 goes toward his Elon University education. The fraternity adjourns to the pregame tailgate party held in the University’s All Alumni Tailgate Village. Elon beats Rhode Island 24-21 in the Homecoming football matchup. Postgame gatherings include meetups at Magerk’s Pub in downtown Elon, the ‘Rocking RV Party’ at the Arts West parking area, and a party for the ‘Neese House Gang’ at the home of Janine & Ron Osborne #96 in west Burlington. November 2018 — During the annual month-long campaign to raise funds for the Movember Foundation, the chapter achieves a national ranking in the top ten among college campuses by raising $22,460. This represents the sixth consecutive year that Elon’s chapter of Kappa Sigma has raised over $10,000 for this worthy cause. December 3, 2018 — The chapter hosts and leads a campus workshop on the IMH program “My Brother’s Keeper”. AA Stuart Sioussat presented and Sam Olson #877 coordinated the logistics. Elon University Vice President for Student Life Jon Dooley is among the campus officials present for the well-received activity. Also on this date, IMH announces Sam Olson #877 is among the 401 undergraduates fraternity-wide to receive a Kappa Sigma Endowment Fund Scholarship-Leadership Award for 2018. January 7, 2019 — The chapter elects Sam Olson #877 as Grand Master. February 7, 2018 — As of this date, eight initiates of Lambda-Lambda Chapter are members of the ‘Jackson’s Men’ endowment fund at IMH: Arthur G. Dornik #323 (Pin 233), Carter MacKenzie Smith #321 (Pin 1,200), Carson N. Copeland, II #652 (Pin 2,336), John M. Kalas #605 (Pin 2,337), William S. Denham #658 (Pin 2,340), Evan J. Williams #737 (Pin 4,157), Glenn A. Craig #191 (Pin 4,726), and Gary W. Evans #1 (Pin 4,727).